A surprise hit for Subaru when it debuted for the 2013 model year, think of the Crosstrek as a bit-sized Outback. With small SUV dimensions and low 20s pricing, the Crosstrek sells at a quicker pace than any other Subaru not named Forester or Outback. And now for its second act, the all-new 2018 Crosstrek is more spacious, more rigid, and a bit more powerful. The Crosstrek earned my respect when I off-roaded one several years ago. With nearly 9” of ground clearance and, of course, standard all-wheel drive this thing can go just about anywhere. And because it’s neatly sized, the Crosstrek makes for a great companion on the trail. It’s also one of the least expensive Subarus, with a more youthful spirit and a splashy color palette including this awesome Cool Gray Khaki. You can even get one with a manual transmission, if you like. But don’t worry; though this 2018 model is all-new it’s more of an evolution of what was already good. First off, this Crosstrek looks, feels and drives with next-level refinement. The design is crisper, interior quality elevated considerably, and it drives with more substance on-road. The wheelbase has been stretched over an inch. It’s also a little longer and wider so you get more rear seat legroom. With a split fold rear seat and a wider rear gate opening, the 2018 Crosstrek has a larger cargo area. The cargo shade and waterproof cargo tray are standard and the liftover is more favorable than that of an SUV. Ditto for loading the roof…the benefits of a high station wagon. The model I’m driving is the 2.0i Limited with the optional EyeSight driver assist technology package for a total MSRP of $30,655. This is the top of the line Crosstrek with 18” wheels, LED steering responsive headlights, the very likeable STARLINK multimedia system with CarPlay, Android Auto, navigation and uplevel 8-speaker Harman Kardon sound system, high-grade multi-function display and this stylish orange stitching. This one also comes standard with the CVT – short for continuously variable transmission – with a 7-speed manual mode accessed through the paddle shifters. The 2.0-liter 4-cylinder engine gains direct fuel injection this year delivering a very modest bump in horsepower from 148 to 152 though Subaru claims it boosts both performance and drivability. Fact is, the Crosstrek’s go system isn’t going to leave much of an impression either way. It’s neither satisfying nor off-putting. It just is. 29mpg in combined driving remains the EPA estimate though city driving goes from 26 to 27mpg. And with a larger gas tank, the driving range has been extended to 481 miles. The Crosstrek is my favorite Subaru because it best represents the brand; utilitarian, AWD, sized and priced just right – the Crosstrek looks good, it feels good. It’s Subaru at its core. Now, to no one’s surprise the powertrain isn’t going to make you all giddy but it feels more acceptable here than in other Subies. The all-wheel drive system includes torque vectoring for improved handling, and an X Mode with hill decent control that comes in handy for low-speed off-road work by locking in the torque distribution between the axles. You can even monitor such things and more on this top screen, controlled through a steering wheel switch. It’s stellar off the tarmac – rigid, controlled, confidence inspiring. The raised suspension also provides a very comfortable on-road ride where this Crosstrek drives with a little more purpose and verve. 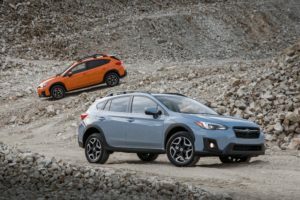 It’s not sporty per se but it’s pleasant to drive – from its easy step in height to its uncomplicated procedures, the Crosstrek quickly makes friends. The passenger seat could use height adjustment, however. Plus, the EyeSight safety features are remarkably comprehensive at this price point with adaptive cruise control, pre-collision braking, lane keep assist, auto high beams and much more. It all works easily, too. The cabin is a little noisy still, but exudes a much higher quality feel than before. Subaru is making strides in this area but the rear seats are still pretty unimaginative with short seat bottoms, no HVAC ducts and no USB ports. They do fold flat though when needed. As Subaru is about to expand into the premium 3-row realm with the Ascent, it’s nice to see that the Crosstrek is taking care of shoppers at the other end.